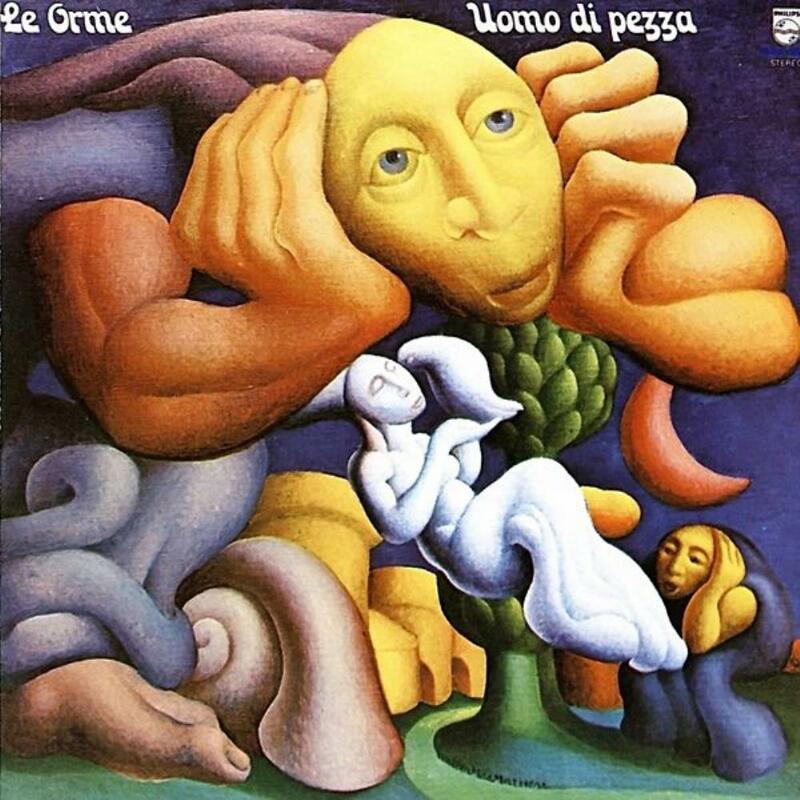 First true progressive album by Le Orme, "Uomo di Pezza" ("Rag doll man" in English) offers a music on par with its cover art: sweet, mellow, reassuring, oneiric... The disc can be divided in two sides: Side 1 incorporates classical music elements and could be described as symphonic prog, whereas Side 2 - my favorite - is more dreamy and soothing. However, the compositions possess a proper Italian sensibility that cannot be found on British bands. Keyboardist Antonio Pagliuca plays synthesizer for the first time on this record. To be honest, I'm not really a big fan of Side 1. The opening of "Una Dolcezza Nuova" is the introduction of JOHANN SEBASTIAN BACH's chaconne no. 2 in D minor, BWV 1004, played by guest pianist Gian Piero Reverberi. The rest is a delicate ballad, smooth but a little cheesy. Released as a single in Italy, "Gioco Di Bimba" is a gentle naive song, typically Italian, with a slight medieval touch, a bit too sugary for me. Some nice floating passages can be found on "La Porta Chiusa", the longest track of the disc. Influenced by symphonic prog bands such as ELP or KING CRIMSON, the song contains a few changes, but is overall uneven. Nonetheless, the dream really begins with Side 2. The soft "Breve Immagine" is a pretty moment, touching and enchanting. The spacey ethereal keyboards enhances the oneiric impression. Too short. The delicate "Figure Di Cartone" has a beautiful melancholic melody, while the trippy crystalline "Aspettando L'Alba" seems to come from the unreal world depicted on the cover, somewhere above the clouds. These three songs are simply delightful. The only intruder here could be "Alienazione" and its more oppressive ambiance. This threatening instrumental, jazzy at times, is nevertheless quite nice. Despite the average tracks of Side 1, Side 2 is well worth the listen alone and make "Uomo di Pezza" an essential record of the genre, possessing its own charm and identity. Furthermore, the music is coherent with the cover art. As a non-Rock Progressivo Italiano fan, I recommend this album to people into symphonic or even space prog wanting to discover this style and, of course, to RPI lovers.